In this episode, we take a look at Gyromite, a game meant to be played with the NES launch curio, R.O.B. In Gyromite, you play as Professor Hector, a grossly incompetent scientist who has inexplicably left dynamite all over his lab and accidentally let his nightmarish lab experiments out of their cages. Your job is to collect all the dynamite, while not getting eaten. Oh, and your only lifeline is R.O.B, who can raise and lower pipes. You can’t talk about Gyromite without first talking about R.O.B. Nintendo’s Robotic Operating Buddy is difficult to critique in the context of 2018. At the time, it must have been a delight to have this futuristic looking robot to play games with, even if its mechanisms of interaction with the game were actually pretty rudimentary. The novelty was surely enough to be entertaining for at least a little while. However, Gyromite, one of only two games you can play with R.O.B, is decidedly not fun. The puzzles are small and easy to solve, with the only challenge being how long it can test your patience while R.O.B’s agonizingly slow movements complete. (The game gives you 1,000 seconds to complete each level for this very reason.) 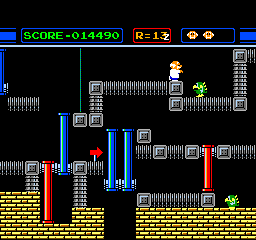 Mode A, which fits the typical puzzle-platformer style, offers the most engagement, while Mode B’s sleepwalking Professor Vector leaves you with only issuing commands to R.O.B. Not the most engrossing stuff. Today it’s hard to even get a setup together that will make Gyromite playable as intended, since you need the game, a CRT television, and the now expensive R.O.B. peripheral. So if you don’t have all that, you’re left with half a game. This can be rectified by recruiting a friend to hold the second controller and shouting commands to them. He or she must sit silently for 20 seconds before pressing the appropriate button. Playing without R.O.B. and holding the controller yourself reduces the difficulty of the game to almost nothing, since most of the threat the “Smicks” provide is nullified from being able to raise and lower the pipes at will. While Gyromite is certainly unique, it would be comical to suggest that it’s important. R.O.B. was a marketing stunt, made to give the impression that the NES was more toy than video game system. The game was pretty much mandated by stores like Toys-R-Us or they wouldn't even consider saving shelf space for the system. Ever wondered why they called it an Entertainment system instead of a Game System? Nintendo wanted to remove themselves as far as possible from the 1983 crash. It may have succeeded on that count, but Gyromite itself is wholly unremarkable.